Alrighty kiddos, today is Fitness Friday! Who else is excited? I know I did my fair share of teasing you guys yesterday, but it was all in love. The truth is I’ve been thinking a lot about whether or not I really want to publicly share what was inside that little package with you all today after all. Let’s get really honest for a second. Listen- I know that you open yourself up to criticism when you put your life in a blog, or an online journal or what have you. Inevitably, there will be people that make snarky comments, scoff at your so-called “expertise” and who want to make you feel small because they A) don’t want you to succeed for one reason or another, B) are jealous, or C) they really think you’re a dumb dumb dumby and that you have no business giving advice or sharing your story. I think what I’m sort of getting at here is that I’m not perfect. I still have a lot to learn about a lot of things, and just because I’m on here writing a “healthy living blog” doesn’t mean I think I know everything about health and fitness and nutrition. Far from it. I didn’t go to school for that. It isn’t the career that I have, or the field that I’m working in. Yeah. I really love all that stuff. A lot. Does that mean my eating is super clean and my workout record is perfect all the time? I have slip ups. I go through periods of time where I don’t eat as healthy and don’t workout as hard or as often. I hit plateaus. I get discouraged, fall off the wagon and wait way too long to get back on. But what I’ve come to realize is that this behavior isn’t unique to me. That probably describes 90% of us. I’m a fan of the culture surrounding fitness. I like inspiration and motivation and new workout ideas and fit quotes as much as the next person. But sometimes I think we have problems crossing the line between motivation and degradation. Arguing endlessly over who’s mode of training is the best, P90x vs. Insanity, yoga pitted against boxing, what foods you should and shouldn’t be eating or whether or not eating 6 small meals a day is better than eating 3 normal meals a day…it’s a little bit insane, if you ask me. I know so many people who don’t even want to start a workout program period because they think they’ll be teased over it, or told it isn’t good enough. I’m going to say something. I know a lot of people will disagree, and that’s okay. I’m going to say it anyway. Fitness can not be about one upping each other. It has to be about support and encouragement. This isn’t to say a little healthy competition isn’t always a great thing- I happen to love competition. I’m talking about workout shaming and “clean eating”/ macro counting shaming. So what, you’re big into weight lifting or think Crossfit is the only path to health that there is. Someone you meet tells you they really love Zumba, or maybe Jazzercise. Give that person a high five. They are doing something good for themselves, and they are enjoying it. Because that’s the key, isn’t it? Yes- I can pretty much promise you that a round of power hour at Title Boxing is going to burn more calories than a 30 minute session on the stationary bike. POWER HOUR BURNS ZERO CALORIES IF YOU’RE TOO AFRAID TO GO TO IT. Any super intense, -my-lungs-are-burning-I’m-swallowing-sweat-I-want-to-die workout will not work for someone that doesn’t want to go to it. Consistency is so important. Not everyone wants to feel like their lungs are going to explode when they hit the gym- while others do. The only thing I’ve found to consistently, without fail work time and time again is to find a workout you enjoy doing, that you’re excited about, that you can feel and see positive changes with- and do that. You will never see me toting one specific type of exercise or diet program (paleo vs. low carb) on this blog. What works for me might not work for you. Yes, I’ll do/create workouts, take classes and use DVDs and provide my personal take on them- but these are only suggestions. Let me let you guys in on a little secret– over the past 7 years, I’ve shelled out a lot of money on the fitness industry. I’ve done it all. Sought advice and program consultation from professionals, seen nutritionists, bought a gazillion workout DVDs, tried a ton of “weight loss products” and I have a subscription to every major fitness magazine out there. I’ve spent years trying to follow “the next big fitness trend”. I’ve tried a bunch of different types of healthy eating. I have run the gammit- from running 9 miles a day, nearly starving myself and treating exercise as punishment to actively avoiding physical activity and eating whatever I wanted. neither of these feels good. Neither does chasing fitness fads. Struggles with body image, weight loss, weight gain- I’ve done it all, guys. I’m tired of the constant struggle. I’m tired of seeking new ways, new products and new fads. I’m tired of shelling out money left and right because I keep thinking someone else is going to have the answer, just to be patted on the head by the “professionals” and the “experts” because I’m not doing the right type of workout, or I’m not eating what I should as often as I should. Heaven forbid I don’t get the perfect ratio of carbs to fats to protein on any given day. I’m ready to be the expert. I’m ready to be my own expert. 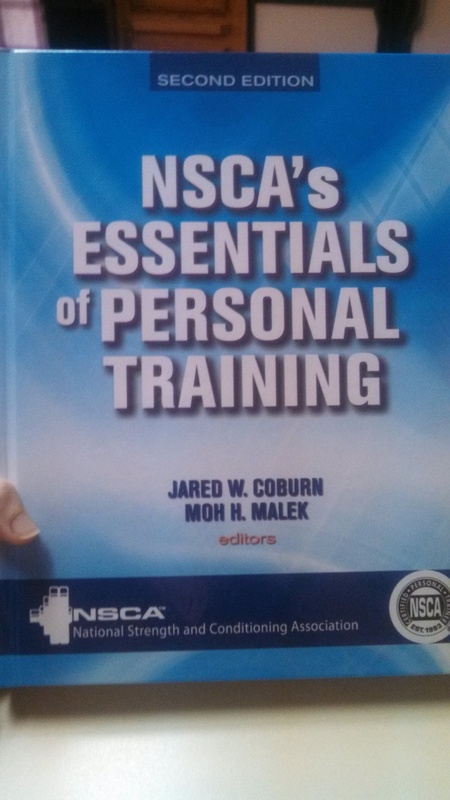 The idea of becoming a personal trainer is an idea that first came to me probably 2 years ago. Before then, I had never even considered it. But it kept coming up, and it was something in the back of my mind that I could never quite squish down. It kept peeping its head out. I kept shoving it back. There were a bunch of reasons why I did that. Probably the most obvious one being that I didn’t feel ready. Being a personal trainer means being knowledgeable in all aspects of the field, being confident, and telling others exactly what to do so they could accomplish their own fitness goals. Well, I couldn’t even accomplish mine. How was I supposed to instruct someone else? Fast forward another year or so and I’m still knee deep in this same struggle. Then finally, one day, I realized that if I keep waiting and keep waiting until I figure all of this stuff out- it’ll be too late, and the dream will either be impossible or simply implausible. I also decided that if I was going to do this, then I was going to completely, 100% immerse myself in the experience. I’m not someone that fitness comes easily to. I work hard, really hard at it. I can’t let up. Healthy eating and exercise are married to my life- and it’s something I have to think about all the time. This was standing in my way. How many of my clients will feel, or will have felt, just like that? How many of them will feel as overwhelmed and discouraged and defeated as I have at times? I realized that my past experiences, defeated as I may have felt in the midst of them, are what give me a unique perspective. Not only will studying for my certification get me closer to this career goal, but it will get me closer to where I want to be with my fitness goals. In the end, I just want to be someone that people trust. Honest. A resource. I don’t want to just know the information, I want to live it and share it. I want to go through it. In this way, I can experience the training, implement the ideas and go through the process as I’m studying- effectively giving me exactly the experience a training client would have. This was a really exciting prospect for me. So, after much debate and lots of prayer, I did it. 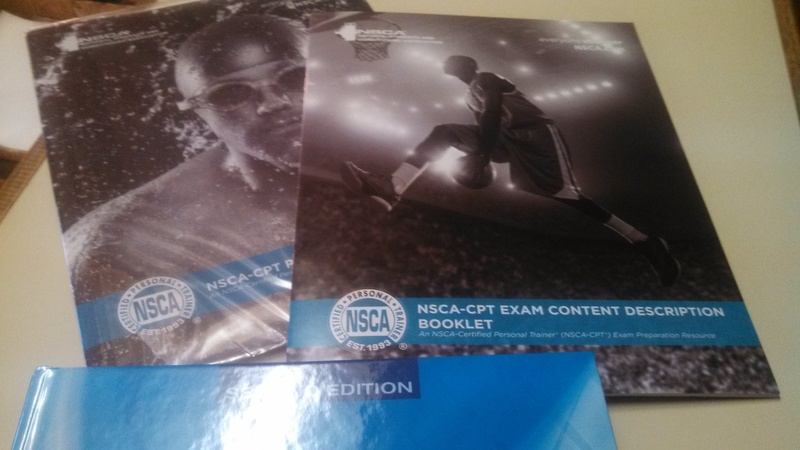 I bit the bullet, and with this really scary and big decision made, I ordered my Certified Personal Training study materials and books two weeks ago through my chosen certification, the National Strength and Conditioning Association. I did my research- 6 months worth– before making the final decision. I’m feeling very pleased with it so far. The exam takes around 6-9 months to study, and I’ll have go get re-certified in both CPR and AED before hand, which admittedly I’m not looking forward to. But I am so excited about everything else. I don’t have it all figured out. I know it will take me longer than the normal 6-9 months to study because I work a full time job and I’m smack in the middle of planning the most important day of my life. The biggest, and in my opinion, scariest move for me was to make the decision at all, buy the materials and know that this is in my future. It’s coming. 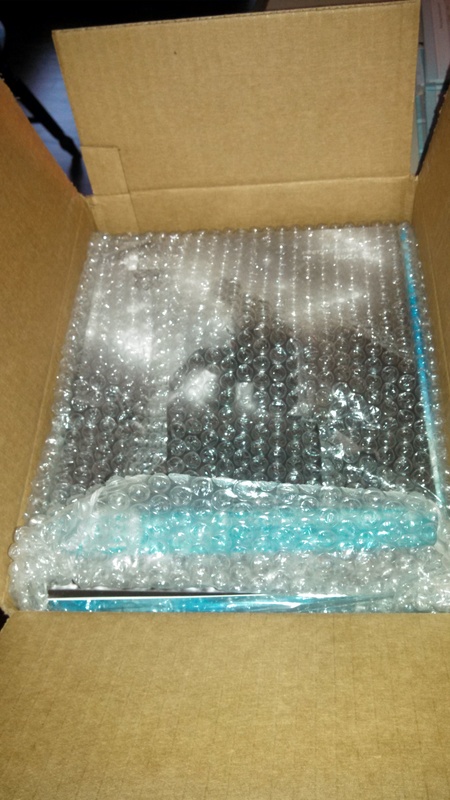 My books arrived on Tuesday, and I’ve been jumping out my skin and going back and forth trying to decide if this was something I wanted to share or not. Truthfully, I wasn’t sure what the reaction would be, or if there would be ridicule involved. Then I sort of realized- so what. The good always outweighs the bad, and besides that, the point of this blog was never to build myself up and make me feel awesome. It’s always been to inspire. That was always the hope. I know this post sort of seems jumbled. It’s half rant/half announcement. But it’s so important to me that I’m honest with you guys. I want to share this journey with you because I know there are others out there who have similar stories to mine, and who might feel as discouraged as I did once. My one hope is that through all of this- this journey, the blog, my story- I can inspire someone.